Akebia Quinata is sometimes called ‘The Chocolate Vine’ is a fruit native to Northern Japan. Also known as the Chocolate Akebia this is a evergreen to semi evergreen climber. 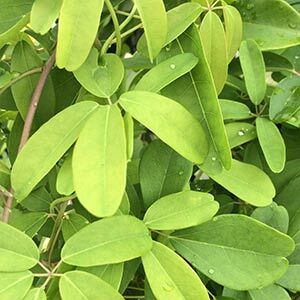 A fast growing climber Akebia Quinata may be deciduous in cooler climates however in warmer areas it can be used as an evergreen cover. Pale green foliage with purple cup shaped flowers in spring this is a useful climber for a range of landscaping projects. Why the name ‘Chocolate Vine’ ? Simply the fruit smells like chocolate. The flowers have a vanilla fragrance to us, purple to brown in colour and appearing in summer, in warmer climates this climbing plant will flower from spring onwards. This is a vigorous plant in warmer climates and needs to kept under control. Often described as ‘robust’, it does have a tendency to spread if left to its own devices. Used to grow over fences as a covering plant, as well as over pergolas and trellis for shade. This is a plant that can be trained along wires to useful effect. Also very useful when planted in fragrant or sensory gardens. Flower Colour – Purple to brown. Mulch around plants to maintain a cool root run. The Chocolate Vine can be pruned back a little after flowering, or pruned back hard in winter.